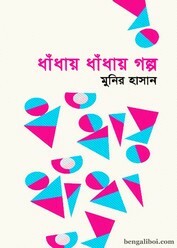 'Dhandhay Dhandhay Galpo' is a collection of Bangla puzzles. The book can help to increase our children knowledge.Author Munir Hasan was born on July 29, 1966 in Chattogram, Bangladesh. Now he is general gecretary of Bangladesh Mathematical Olympiad Committee. Along with math he works for the spread of science and computer programming. There are many famous riddles and ridders in the story of Me and Rima or Bumbum and his khala. Sam Lloyd to our old villager! Our folk puzzle with famous classics. 'Harir upor hari, Hari shova pay, Harike dekhia Hari Harite Lookai'-'Dhandhay Dhandhay Galpo' this book is about the puzzles of Bumbum.